The UK's Department for International Development in developing and steering the first phase of the UNCTAD-ICTSD Project on Intellectual Property Rights and Sustainable Development, 2001-03. 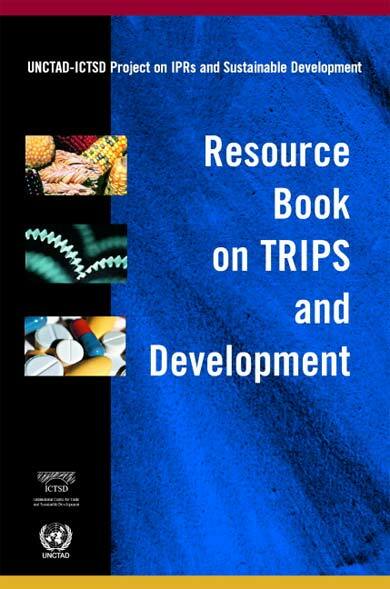 This lead to the production of a range of materials on TRIPS and Development, notably the Resource Book on TRIPS and Development and an internet site for web based resources on intellectual property and development. The project also promotes regional dialogues and capacity building in developing countries around the world. CEAS Consultants (Wye) Ltd, Centre for European Agricultural Studies, co-authoring a "Study on the Relationship between the Agreement on Trade-Related Aspects of Intellectual Property Rights and Biodiversity Related Issues" for the Directorate-General for Trade of the European Commission. CIDSE (International Cooperation for Development and Solidarity), initial drafting of the position paper "Biopatenting and the Threat to Food Security - A Christian And Development Perspective". Saana Consulting, on "The role and Perspectives of "Non-Traditional" Providers of IPR Technical Assistance" available online in the final report of workshop "Reflection on IPR Technical Assistance for Developing Countries and Transition Economies", Burnham Beeches, 15-17 September 2004. IP Watch or Intellectual Property Watch, is a non-profit independent news service. It reports on the interests and behind-the-scenes dynamics that influence the design and implementation of international intellectual property policies. Knowledge Ecology International (KEI) is a not for profit non governmental organization that searches for better outcomes, including new solutions, to the management of knowledge resources. It aims to advance the public interest in intellectual property policy.